S/sgt. Gerald D. Ellis, son of Mrs. Irving Ellis, attended Mt. Zion Com. High School, Ill., Chillicothe Bus. College, Mo. ;husband of the former Katherine Moring. 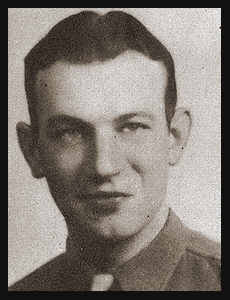 Entered the Army in July, 1942, trained in Camp Gruber, Okla., Ft. Ord, Cal. ; went overseas in Dec., 1943; served in Goodenough Is., New Guinea, Biak Philippines; was honorably discharged in Nov.,1945. Awarded Good Conduct Medal, Asiatic Pacific Ribbon with two Battle Stars, Philippine Lib. Ribbon with one Battle Star, Am. Defense Ribbon, Victory Ribbon.